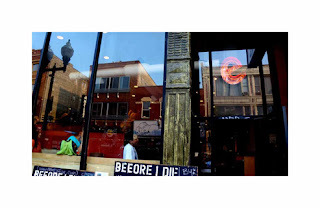 READY Coffee, a new independent coffee shop at 1562 Milwaukee Avenue in Chicago’s Wicker Park (773-360-7041; http://readycoffee.com), has opened with enthusiastic customer buzz about its high quality, locally roasted coffees, and unbeatable prices. 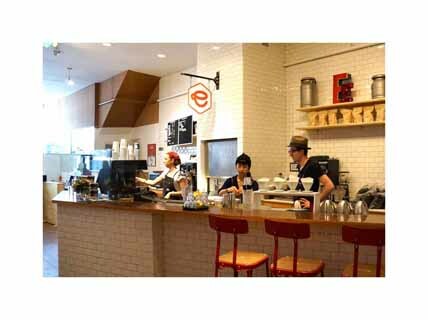 While the mood is informal and creative, the owners demonstrate that they are serious about challenging the coffee world with a refreshing take on coffee shops. 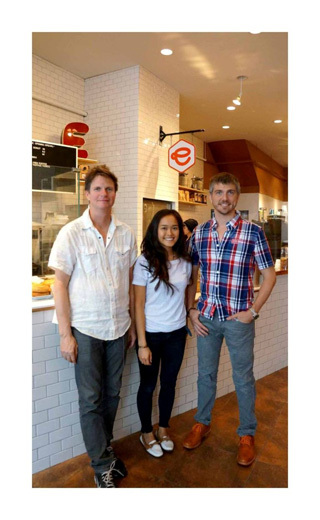 “We are fully committed to offering customers a quality experience at down-to-earth prices,” said owner Adam Banks, a recent MBA graduate of the University of Chicago Booth School of Business, who wrote his senior business plan on squaring off with the coffee industry at low prices. This research plays out in the logical $1, $2, and $3 drink menu. All of the READY Coffee blends are roasted locally by legendary Chicago coffee roaster Greg Stivers. “With 28 years of artistry under his belt, a roasting facility in Pilsen, and his ability to roast to our specifications daily, we can guarantee an ultra-premium cup of coffee.” Banks said. READY Coffee is an instant success among the locals for the shop’s price, quality and unique offerings. It is a vibrant local hangout and is spacious, with enough room to accommodate more customers than most coffee shops. It has a clean, contemporary feel, a great art collection, and serves excellent coffee beverages, pastries, sandwiches, soups and other homemade goodies. John Grbac and Banks developed the READY Coffee concept. Grbac is a noted Chicago restaurateur who was one of the first in Bucktown/Wicker Park with Jimo’s, and one of the first to energize the neighborhood, leading to its resurgence. “We are obsessive about our quality,” said Grbac. “I have been in the business many years and we can give people what they want, a great cup of joe at a great price. Starbucks just announced a 10% across-the-board price increase. That level of pricing just doesn’t make sense,” said Grbac. “There is a war going on in the ultra-premium sector of coffee, we are seeing $7 coffees on menus – and you have to wait in line to get that cup of coffee. We built ready on the concept that there is a large percent of the public that just wants a quality cup at a great price. Ready is just that, quality and price, no pretense, and no waiting,” explains Banks. The better-than-reasonable prices start with READY’s one-dollar “Buck Cup”, a 12 oz. cup of premium drip coffee made from the 100% Arabica house blend. Larger cups of drip coffee are served for $2 (16 oz.). An additional shot of espresso can be added to the drip coffee for $1. In another nod to quality, all iced coffee beverages are made to order and served with coffee ice cubes, which enhance the richness of the brew rather than diluting it. Drip iced coffee is $3 for 12 oz. and $3.50 for 16 oz. For coffee aficionados, READY Coffee also offers ten global all-Arabica coffee blends from Greg Stivers that can be used for pour-overs (single cups of coffee made using special drip filters). 12 oz. pour-overs are $2.50; 16 oz. cups are $3. READY serves its pour-overs either hot or iced (using coffee ice cubes). These exquisite small batch blends can also be purchased by the pound as whole beans or freshly ground to order. The smooth but wonderfully intense espresso-based beverages are made with Greg Stivers small batch roast espresso; all start with double shots. The espresso menu is refreshingly straightforward: A double shot espresso or Americano is $2. Flat whites, cappuccinos and lattes are priced at $3 for 12 oz. and $3.50 for 16 oz. An extra shot of espresso in any espresso beverage is $1. READY Coffee also presents a variety of natural flavor syrups, which can be added to any coffee drink for fifty cents. There is more to the READY Coffee story than coffee. 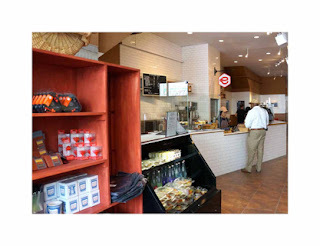 Food items also reflect READY Coffee’s emphasis on serving the best at good prices. All food items are made for READY Coffee by some of Chicago’s finest bakers. READY is the first wholesale customer of Dinkel’s donuts, which are made with no GMO flour. “We are thrilled to carry Dinkel’s doughnuts—we love that we are selling the best doughnuts in town,” exclaims Grbac. “Dinkel’s has been baking for 80 years, and for good reason.” READY Coffee’s delicious croissants, brownies, pastries and sandwiches are from Delightful Pastries. READY Coffee also serves free filtered still and sparkling water. Customers who want to add a shot of natural flavor syrup to a glass of sparkling water can enjoy having a house-made Italian soda for $2. walls. Every smooth, white-topped table has its own AC power nearby; READY has installed super high-speed internet in order to make web-browsing fast and reliable. The tables are easily moved around to form two-tops, four-tops or more. There also is a community table for larger groups. Customers are encouraged to stay, enjoy a respite, meet friends or do work at their leisure. To further showcase artwork, READY Coffee has an Art-o-Mat machine, a uniquely refurbished vintage cigarette vending machine that has been converted to sell small pieces of art wrapped in cigarette boxes. The art sells for only $5. “The Art-O-Mat is the coolest machine that I have ever seen,” said Banks. “There is one in the National Portrait Gallery (a Smithsonian Museum) and it’s really a beautiful piece of art in and of itself.” Anyone interested in providing art objects for READY’s Art-o-Mat should call the store at (773) 360-7041. READY Coffee, located at 1562 N. Milwaukee Avenue in Chicago, is open from 7 a.m. to 11 p.m. every day. For more information, call (773) 360-7041 or visit the website at readycoffee.com, like them at Facebook.com/readycoffee and follow them on Twitter @ReadyCoffee.